Yesterday I started a lesson on right triangle similarity and the geometric mean by throwing a task to students and seeing what they would come up with after 5 minutes of independent work time. In all classes, I had a similar (get it, geometry teachers?) breakdown on students’ ability to approach the problem: Some were stuck on where to even begin, some tried to use yesterday’s skill, and some made connections to earlier geometry units. What really varied were the conversations and debates we had after the independent task work. First period: My opening question was, “What are you thinking about this problem?” I got three hands (out of 33 students). The first two to respond were pretty timid, though student #2 did build on student #1. Student #3 then confidently gave the answer and explained the problem. 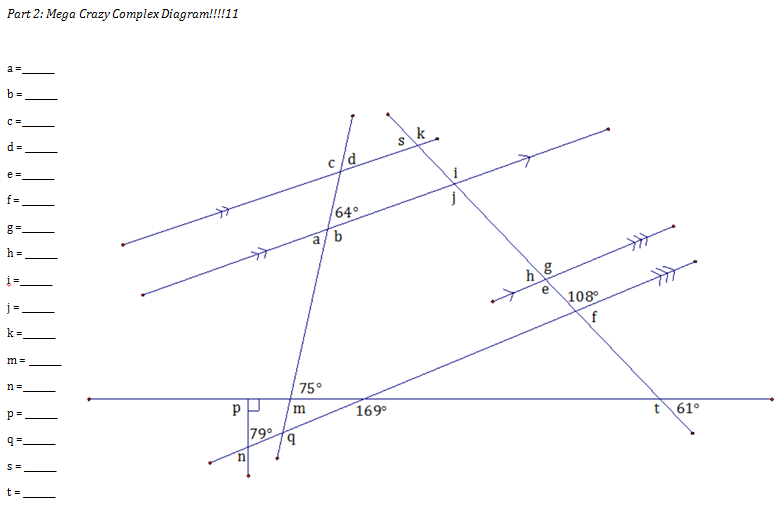 I wasn’t satisfied with this at all because the whole idea was that it was a totally new problem on something they hadn’t seen before, and I had wanted students to bring up different ideas, respond to each other, and then argue until we settled on the new idea that all three triangles in the diagram are similar. I realized that my question had to change. By asking, “What are you thinking about this problem?” which to me, seemed like a pretty low-stakes question, I think I was unintentionally suggesting that they needed to give me a right answer– no matter what. Second period: This time I asked, “What are you thinking about this image that may or may not help us solve it?” More hands this time, from students of varying skill levels, but again, not a lot of debate and/or responding to each other. Third period: The new question was, “What do you notice about the picture?” Participation improved, as did the follow-up conversation. Fourth period: I finally tried out “What do you notice? What do you wonder?” I’ll admit, I hadn’t used this word choice before because it sounded a little corny to me, but wow, students really responded to it! Participation was the best of the day, and what I was really happy about was that many of the contributions came from students who typically don’t participate and who are nervous about giving an incorrect answer when cold-called. Rather than prefacing their responses with “So I’m not really sure, but…,” they just automatically started with “I notice… and I wonder …” They totally got that the idea was to just squeeze whatever mathematical juice they could out of the problem– whether or not it was relevant. By the end of the conversation, I had a rich list of discussion notes on the white board, and the class had basically generated all of the key points for the mini-lesson. “What do you notice? What do you wonder?” is definitely here to stick. Here are three ideas to help students gain comfort with parallel lines and angle relationships. I give kids a series of diagrams like these two. First they highlight the parallel lines in one color, and then they highlight the transversal in a second color. I copy the diagram on the worksheet multiple times so that they can re-highlight for each of the transversals. Once their diagrams are highlighted, it’s a lot clearer for them to see whether certain angles have relationships (corresponding, alternate interior, alternate exterior, or consecutive interior). This helps set them up to later use the converses to identify lines that must be parallel. I don’t know what it is about this diagram from Discovering Geometry, but kids love, love, love it. Last year, I made the mistake of trying to walk them through it. This year, I hadn’t even finished saying “Flip the page. This is super hard. Try it with your partner,” before several of them had already figured out the first three. I also love angle q because there are so many ways to figure it out, and they can bring in knowledge about interior angle sums of triangles or quadrilaterals that at this point in the year we haven’t formally talked about but that many of them know from middle school. I use this a few days into the unit, once students start studying the converses. I have colored A, B, C, D cards. 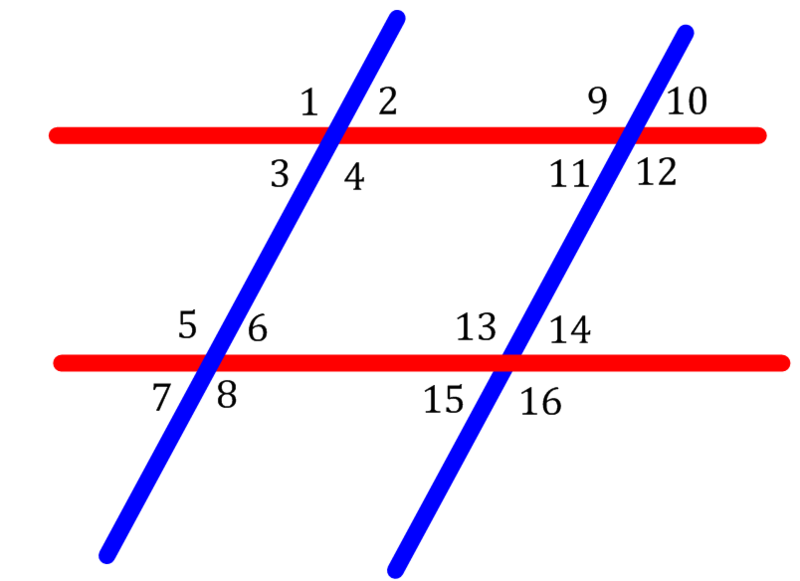 In partners, they have to hold up card A if the red lines are parallel, B if the blue lines are parallel, C if both pairs of lines are parallel, and D if there’s not enough info or it’s impossible. The cards are fun, but it could of course be recreated with other materials or old-fashioned snapping. I say an angle cue (i.e. : “angle 2 is congruent to angle 10”), and then students have to whisper with their partner, secretly pick a card and then hold it up at “3-2-1- UP.” (I found that working in partners made the activity less anxiety-inducing if a student was the only one to hold up the wrong card.) Then I cold-call on someone who got it right, and they have to tell me the formal justification (i.e. : “Converse of the Corresponding Angle Postulate”). I’m sharing my worksheet below. Let me know if you make it better! Have you seen the movie “Memento”? Remember, the one where the guy tattoos helpful reminders like “Never answer the phone” and “Don’t trust John G.” on himself, so that he can retain information and survive? Originally I thought my blog would be a series of pithy statements that I could use in case I ever had a terrible accident, fell into coma, and needed to quickly figure out how to teach. Lessons about teaching rarely fall into the neat “Do this” and “Don’t do this” categories that I originally envisioned. I had this idea that once I followed one of my lessons, everything would be perfectly the next year. Doesn’t quite work like that. Time for a new type of blog. Feeling oh-so-confident after the success of my first-day task (https://irregularbutnotobtuse.wordpress.com/2015/09/14/lesson-1-scrap-the-first-day-syllabus-read/), I had only high hopes for the next lesson, in which students use Geogebra to build some intuition about points and lines: 1.1- Geogebra points, lines, planes- 9-10-15. A lot, it turns out. Fast forward to 10 minutes into the first period of the day. Having not done a proper inventory of the computers, I discovered in the middle of class that about half of them were not properly charging in the cart. That meant that students had to waste time trying to get a second computer, and then when that didn’t work, they had to work in groups of three or four– not exactly conducive to do-it-yourself discovery. And because this is, well, the second day of high school, everything takes about 83 times longer than it should, so many students only got a few minutes of exploring until I gave the “Please log off and shut down” direction. I thought I was being clever. Turns out that children were cleverer. The idea was for them to say that since points don’t take up space, there’s no such thing as a bigger point, but actually you can play around with the font and make the point look bigger. (Duh! Why didn’t I think of that?) So when it came up in class, I had to give some sort of lame, “Oh, but find another way to do it, because that’s not actually bigger,” which definitely confused kids. So, yes, it’s important to use computers. And, yes, you shouldn’t wait to do non-traditional things in the classroom. But, next year, how about keeping that laptop cart closed until, oh I don’t know, week two at least? One of the advantages of starting school so late is that I get to lurk on Twitter, spy on all of the other teachers’ great ideas, and then implement them in my classroom. This year, I was inspired by several teachers’ posts about first-day lessons. They were throwing kids into difficult tasks right from day 1. Wait, you mean, I don’t have to make the kids read the syllabus out loud and ask me crazy questions about how many inches their binders have to be? Great! I decided I had to follow suit. Using a Discovering Geometry question to get me started, I came up with this worksheet that motivates the need for a compass through a problem-solving activity: 1.0- Buried treasure exploration- 9-9-15. It was a hit! Kids were really challenged, and the material was hard enough for them that they really needed to work together to solve it. The plan is to return to the third part of the activity later on in the unit after we introduce constructions. Hopefully that will give kids the “Ah ha” moment when they connect the activity to the math skill.